Hello and welcome to my blog! 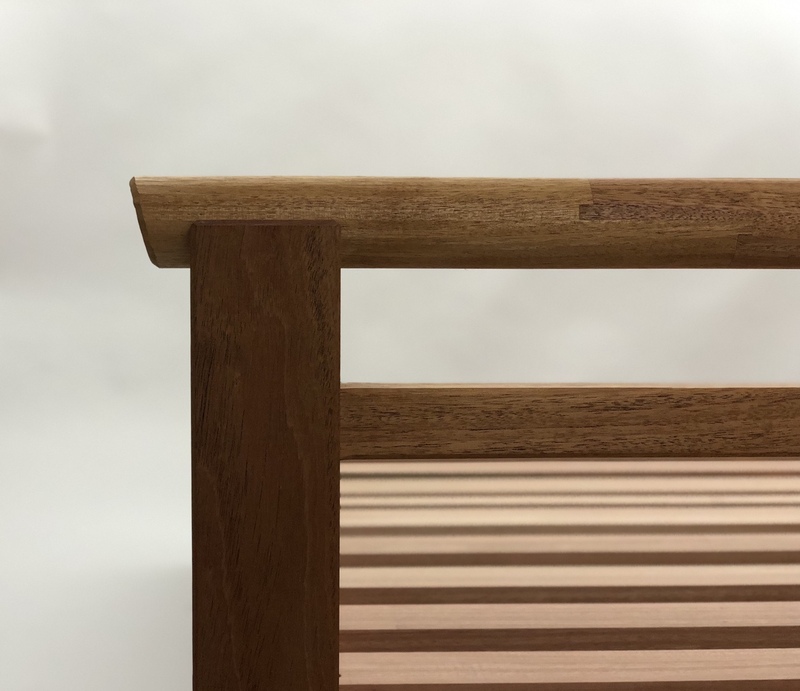 This post details the build of a daybed in Honduran mahogany. This daybed is planned for outdoor use under a covered patio. The build was planned to be fairly quick by comparison to most of my builds to make an installation timeline. This build is complete which allows me to illustrate detailed sections in their completed form prior to describing their processing. Shown here is the finished daybed. I picked up 12/4, 8/4, and 4/4 rough sawn mahogany to began the build and started with a focus on prepping material with great care. I chose sections of mahogany which were mainly straight grained and flat sawn. Working from flat sawn stock left me with plenty of rift material once it was broken down. Flat sawn boards that are in alignment with the outside of the tree make for very straight rift sawn boards. Very few sawyers cut sections like this with intention, so it is often left to the tree itself and where on the tree the boards are cut. If they’re cut too close to the very bottom of the tree then the boards will feature a lot of run-out. Further up and the taper is considerably less dramatic. The first stop with rough material is the jointer. Rather than starting with face jointing, I began with edge jointing to create a reference edge for my bandsaw. Also wanting to leave the material as thick as possible as it went into its rough sawn shape, allowing me to create a pair of references after the material had been broken down. From there it was broken down on the bandsaw then returned to the jointer for reference faces to be be applied. At this point I let the material rest for a few days. This material would make up the legs and sides. When I returned to processing, I next resawed material for side panels. I’m making use of some new toys in the machine shop; a set of Aigner tables. They’ve made the processing work for long material considerably less strenuous. Finally I processed all of the material through to a near finished surface. The long sides required very careful processing, as rift sawn material is typically bowed along it’s length as received from the sawyer. Often I work back and forth between the sides until one becomes flat. This process of removing the strain from both sides of the board is to prevent the bow from reappearing during the thicknessing stage. I don’t do this on every board, but the ones which feature a heavy bow, I will do so. Working with long material and wanting it dead flat consumes a good deal of thickness, thus my reasoning for starting with rough sawn material rather than skip planed. I needed every bit of thickness to arrive at 1.75″ while remaining flat and true, starting from material that was 2″ thick or more. It’s been my experience that time spent carefully processing pays considerable dividends later on in the work and leads less often to second guessing or working out gaps in fit ups. The resulting material is quite nicely sized, straight and flat. Having processed material with hand planes for so many years, seeing a pile of lumber like this after a day’s hours brings me near to tears of joy. This build features a top rail around the back two sides of the daybed, the top rail would be round and so I would need to prepare both rectangular and round section material for the work. With the rectangular sections complete, I decided to rough prep the round sections having wanted to accomplish this section of the work early enough to plan the accompanying work and tooling requirements. Luckily the material processed beautifully and my old Italian made lathe buzzed through the work without a hiccup. Next I returned to the frame work and began by marking out the corner joinery. I planned the corner joinery as blind mortise and tenon, with a near full length haunch. The bed is planned for outdoor use, so I wanted to be able to accommodate wood movement without visible gapping around the joint or uneven surfaces, so for that reason I planned a shoulder around the entire joint, rather than just at the sides. The tenons were cut along with a corresponding gauge block for each tenon. The gauge block was used to aid in checking the fitup for squareness and accuracy, then utilized as a backup while the adjoining mortise was cut in. There is a section where the two mortises cross and having a backup prevented chipping out the inside sections of the joint. Finally the grooves were set in for the panel and haunches. These were processed at the slot mortiser, then the ends chopped square. The slot mortiser is handy for blind grooves. Once the joinery in the outside four legs was completed, they were set aside and my attention was focused on a center support which would divide the back of the bed. This joint became a bit complicated as it needed to accomplish many things. The completed support is shown here. My goal in designing this joint was to allow the side rail to join up with a lap joint at the center post. The rail itself would not be fixed to the support, allowing it to float freely. The reasoning behind this decision, to allow the post to free float, was to prevent the post’s change in dimension with relative humidity from changing the length of the back rail which would cause the joinery to separate in the winter or swell in the summer compressing the sides of the post. The frame would receive another inner frame which would act as a support for the bed slats. This frame would be continuous along the inside of the bed rail. This post would need to act as a support for the rail, but it could not interfere with the dimension of the rail, it had to do so in a manner that would not reduce the strength of either component significantly. This was a bit tricky. I started by cutting the through mortises. Next I cut a shallow mortise to accommodate a stub tenon. The stub tenon would give additional fixturing capability to the assembly. Finally I ran the grooves to receive the side panels. I then carefully processed the tenons, which would overlap inside the joint. I wanted the joint completely housed by the leg so that seasonal movement would not reveal a gap. Both top and bottom rails were completed and joined into the upright. The rails were then grooved to receive the slat support. The slat support was made to join with simple open bridle joints and the support was laminated into the rail with waterproof glue. The glue joint is helpful but not critical to the survival of the bed, since the internal support utilizes the groove for strength and support. The assembly, consisting of simple joinery is beginning to feel slightly more complex now with so many joints coming together at the same time. It also makes for a very assured feeling once the joints are seated. Once the assembly could be test fitted I used the opportunity to mark out for a center support along the depth of the bed. This support joined in with a finger joint. The joint is quite simple and yet very strong. I made the center support to be offset by the same thickness as the slats so that it would act as the center slat. The center support consisted of two adjoining supports, which would cross at the center of the bed. The lengthwise support would join at the center with a halving joint and at the ends with a dovetail joint. The dovetail was very easy to cutout, I simply marked then chopped and pared to form the sides. These dovetails join into the short sides of the bed. This is a neat joint and works to keep the sides from bowing over time but would be covered in the end. These types of dovetail joints have very little strength against racking when they’re cut through (as opposed to blind). However I planed to laminate the end slats which would act to cap the joint and prevent it from splitting out if the assembly racked as I joined it together. This completed the inner structure. Time to knock it apart and move onto the railing. The railing consists of a square section rail running under a round section rail, the cutout would be quite straightforward as well. For the square section rail I cutout using the Bridgeport mill, then square the corners and cut to the layout line by hand. The round section was cut through from either side, also using the Bridgeport mill with a Forstner bit. Accuracy was important here as any deflection would be clearly visible in the finished joint. The mitered joint was cut in from either side with the forstner bit until they came nearly to a finished corner. Not wanting to cut away too much I decided to leave the reminder and cut it away by hand. I cut away the tops of the posts, then finished the joints each by hand with gouges. The cutout now complete, I was able to begin the process of gluing up. The long sides were glued individually. I carefully checked with winding sticks to ensure the result was free of twist, the with an 8′ straight edge to check and ensure the finished assembly was straight. The assembly could be again test fitted to ensure that it clamps up square and to allow for fitting of the top railing. The others would be a double tenoned scarf joint. I used these where additional supports could not be provided. The cutout began on the Bridgeport milling machine. I used it to created a reference surface at the center of each joint, then also to cut in the tenon. The double tenon was chopped and sawed by hand, and the joints were each fitup by hand. I use a quick and dirty method for zeroing the DRO on my milling machine, where I simply run the cutter up to the start of the cut, then zero the DRO. This results in a minor inconsistency of a few thousands here and the. That results in gaps, which then need to be attended to by hand. The rail sections were glued together, then the completed section was planed to size allowing them to fit into the posts. The last steps were to resemble the bed, for a final fitup, then to process and install the slats. The slat installation was simple enough, cutting them to length, cutting a recessed hole for a screw to pass through and then marking their locations and putting them in place. The finished result is still able to be disassembled again for transportation to the client’s location. I hope that you have enjoyed this build and I very much look forward to your questions and comments. Fantastic. Do you draw up plans manually or in software? Thanks Brandon! I use Sketchup for the most part after roughing out my idea on paper. Remarkable, are you considering a book, in the future? Can you show the machines you use? Thank you kindly! I am not planning a book, but I’m not opposed to writing one. I dont use many machines, they’re all in fact shown in the photos here. Did you have a question about one of them in particular? You do outstanding work Brian in what we can see in this post is a fairly simple shop. Thank you Jim! Appreciate the comment! I really like the look of your shop. With such a nice carpet it looks almost as if you are building it in the living room. Hahaha! Thanks Jonas, good to hear from you. Another masterpiece. I was struck by your remark: ” Having processed material with hand planes for so many years, seeing a pile of lumber like this after a day’s hours brings me near to tears of joy.” Wise to let machines do the drudge work and reserve your considerable skills for joinery and the rest. Thank you! I think it is absolutely worthwhile to prepare material by hand for a good number of years. It gives a practical understanding of the process. However, at this stage adding in another few day’s effort to prepare by hand is not always something I can afford to do. So it is nice to see a fine result after a few hours work. Exquisite piece of furniture Brian! Also quite the exercise in joinery. All of which was expertly executed…as per your usual. Very nice work Brian! Thanks Greg! Very much appreciate your comment!